Singer/songwriter Jeanne Mackey offers a rare blend of emotional intensity, wry humor, and global consciousness. In addition to original tunes, her eclectic repertoire ranges from Dar Williams to Patsy Cline, from Pete Seeger to Irving Berlin. A seasoned guitarist, she draws on a variety of styles--folk, classic swing, funky blues, and more--with occasional sprinkles of mandolin, accordion, and banjo. As one listener put it: "I never cease to be amazed by the variety of Jeanne' s repertoire, her ability to match the appropriate song to the occasion, and the strong common bond she strikes with her audience." This is "heart and soul" work (from the Transition Towns movement)--cultivating the emotional, spiritual, and relational qualities we need to take part in the Great Turning from an industrial growth society to a life-sustaining culture. Check out Jeanne's personal essay, "Field Notes from an Elder-in-Training," in the Crazy Wisdom Community Journal. And here's a video of her 5-minute talk, " Confessions of an Elder-in-Training", at Ignite Ann Arbor. Mackey has released a CD of songs from Drop the Knife: A Memoir-in-Song--a disarmingly honest and wryly funny musical chronicle of her search for personal and ancestral healing, from the high desert of the Eastern Sierras to the verdant Irish countryside. Drawing on a lifetime of activism and spiritual seeking, she explores the meaning of magic, homeland, curses, and death. Jeanne Mackey rocked the 1970s East Coast topical music circuit as a young musician advocating feminist values and social justice. Throughout the 1980s, she performed with Lifeline, a four-woman rock band that played at conferences, demonstrations, women's music festivals, and labor union events in the Washington, D.C. area and nationwide. An instructional designer at the University of Michigan, she has directed the multi-ethnic choral group Sacred Song and produced various benefits, including Howard Zinn's "Voices of People's History of the United States." 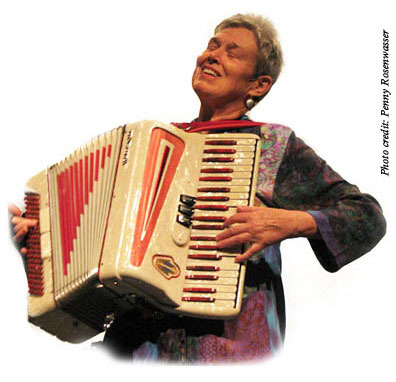 Jeanne's personal essay, Bringing It All Back Home, on the experience of performing her memoir-in-song in hometown Oxford, Ohio, is featured in the Crazy Wisdom Community Journal, along with eloquent reflections from band members Laszlo Slomovits, Lori Fithian, and Eric Fithian. Here's an interview with Jeanne in Between the Lines. Jeanne's CD, selections from Drop the Knife: A Memoir-in-Song,is now on sale in Ann Arbor at Crazy Wisdom Books & Tearoom, and on the web via CD Baby (includes previews of all the tunes). She is accompanied by gifted musicians Laszlo Slomovits (Gemini), Lori Fithian (Drummunity), and Eric Fithian, who also recorded and engineered the album. YouTube videos of several of the songs, filmed at the 11/21/10 premier of Drop the Knife at Keene Theatre, University of Michigan, Ann Arbor, sponsored by U-M Women's Studies. No Time to Hesitate (mp3), a song from Jeanne's new CD. Photos from the 11/21/10 Ann Arbor show and the Oxford, OH show. Sign up for Jeanne's monthly announcements (Google group). Jeanne, you're the cat's pajamas! Loved the show, your beautiful spirit and ability to tell your truths. Seeing this show was a life-changing experience. Loved the storytelling-in-song of the vision fast and curse removal, and the re-enactment on stage. Your songs were wonderful and I loved singing along. We were so wiped out on entering and so filled with energy on leaving! From a U-Mich student: I absolutely loved the performance and the two friends I brought along did as well. ...The stories were rich and engaging...My friends and I also reflected that it was powerful to be in the presence of such strong interpersonal relationships... We hope we can have the same love in our life when we're 60! Your ancestral explorations are inspiring to me. Thank you for setting an example of courage, honesty and integrity.